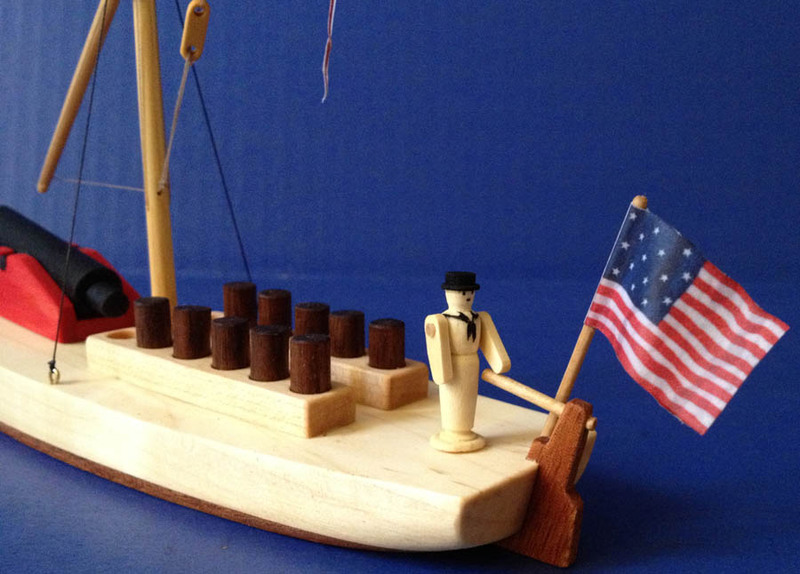 - Great historical and educational toy for kids and adults. - Based on real plans of Gunboat number 5, built in 1803. - Scale 1:100 with enlarged details for playing or using in naval war-games with 15 or 25 mm figures. - Quality hardwoods for hull and parts: maple, mahogany, birch, walnut. - The yard can be lowered/ raised and angled in any position with the help of strong sliding block made from boxwood. - 15 stars flag (and comission pennant on more detailed version) of the period. - Finished with AP approved none toxic India inks or acrylics and food oil, safe for children from 6 to 100. Not for small children! (Be aware of choking hazard with loose small parts). Gunboat number 5 was designed by Fox built in Baltimore in the small group of identical vessels in 1803. In 1805 she crossed the Atlantic on the way to the Mediterannian! Her crew consisted of a commander, a second officer, a steward, 15 able seamen, a corporal of marines and four privates. She sailed for the Mediterannian May 15th, 1805, and reached Gibraltar June 17th. She entered Syracuse July 8th. During August she operated with the American squadron offTunis and then wintered at Syracuse. She returned home the next summer.